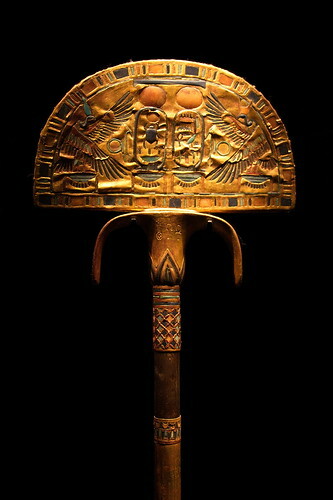 Tutankhamen's golden staff, a photo by The Bacher Family on Flickr. This magnificent staff originally was topped with blue feathers, based on residue left behind in the tomb. The exquisite gold inlay and carving, of course, better survived the ravages of time. This is one of the artifacts found in the burial chamber itself of Tutankhamen. I believe that the cartouche (hieroglyphic inscription) on the top of the staff represents King Tut's name. As with everything else in this exhibit, I'm in awe of the detail and time that went into creating these items. What an advanced society, that could craft such works of art. And yet what a sadly regressed society that did so solely to bury them in a tomb in the belief that a privileged member of society would carry his wealth and influence into the afterlife.